Lower Churchfield, Tourmakeady, Co Mayo. The Connacht Property Auction finished its year of public auction events on a high note, selling 18 of the 21 lots offered at its final public auction of the year, which took place last Thursday, November 22. This was the company’s fifth and final auction event of 2018, with properties from across the province offered for sale, and the auction team reported strong interest and viewing levels in the lead up to the event. A large crowd was in attendance, all in the hopes of securing their property of interest before Christmas. This result, added to the result of the four previous public auctions during the year, leaves the company with an impressive 93 per cent sold rate over the course of the year. Back to November 22, where one of the more popular lots at the event was a well maintained three bed house that offered stunning mountain views. 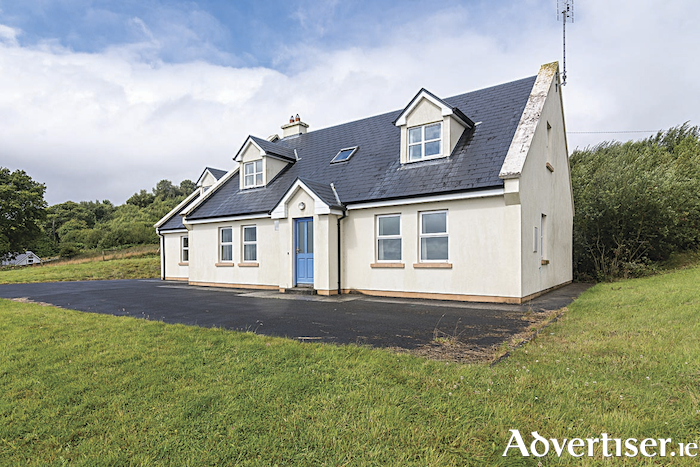 Dooghty Lodge, Cornamona, was offered for sale in partnership with Property Partners Emma Gill and received strong interest from home and abroad. After several bids in the room, the property was successfully sold to a delighted purchaser based abroad for €112,000. Also in partnership with Property Partners Emma Gill, a large four bed detached family home was offered for sale in Tourmakeady, Co Mayo. This stunning property overlooks the beautiful Lough Mask and again received strong interest ahead of the auction event. The vendor accepted a bid of €285,000 prior to the auction. Sold in partnership with Tyrrell auctioneering was an ideal three bed family home in Tuam, Co Galway. The property had good local interest before the public auction and successfully sold for €126,000 to a delighted new owner. A great refurbishment project was sold in Carraroe, in partnership with DNG Martin O’Connor. The property in Clynagh comprised a cottage dwelling and an old shop, both benefiting from sea views. Bids came in quick succession until the hammer fell at €45,000. In Pontoon, Co Mayo, a spacious three bed detached house sold in partnership with Gerry Rowland of The Optimum Group. Massbrook had several bidders in the room, as well as per-registered phone bidders. Bidding was brisk with a number of different parties eager to secure this well located property and after more than 30 bids the hammer fell at €172,000. In Roscommon, a state of the art three bed property in Ballinlough village was sold in partnership with John Higgins auctioneers. No 7 Wallace Court had a starting bid of €49,000 and after some competitive in the room bidding the property sold to the delighted new owner for €71,000.